In Barbara Kingsolver’s Flight Behavior, climate change nudged the monarch population that for millennia (as far as we know) has over-wintered in Mexico to inexplicably settle for the winter months in Appalachia. I cite this wonderful novel as an example of the butterflies being out of place. A story on the radio Sunday told of a former Adventist clergyman who has decided to live for a year without God. He is out of place as his denomination has cut him loose, and some atheists are pleased but others are suspicious. Then there was the ladybug at worship yesterday. I found myself wondering what brings an out of season insect to a Presbyterian Church in January. She may have hitched in on the chancel flowers, but this I do know – I was more than partially distracted from “Developing Christian Character” as I monitored her progress along the pew back. This creature was clearly out of place. Feeling out of place may be worse than being out of place. I have spent a good amount of my lifetime with that feeling and I don’t like it one bit. I have a highly developed “introvert-o-meter” and can generally spot fellow I’s in the room. It turns out that I am better at moving a ladybug to a ficus tree in the fellowship room than easing someone’s social discomfort – nonetheless I try. It’s my goal to reduce the number of people who feel out of place. Do you often feel out of place? Are you called to help others feel at home in God’s world? FYI: During the sermon Ms. Ladybug proceeded several feet on the very top of the back of the pew, and just before she reached college sophomore, Claire’s long blond hair to climb aboard, Claire leaned forward. When Claire sat back I lost visual contact for the rest of the service. After the postlude the ladybug was discovered between the cushion and the pew back. She posed on the hymnal before relocation to the ficus tree. Christmas has turned into Epiphany. Churches that follow a liturgical calendar observe the shift in seasons on January 6, the day celebrating the arrival of the Magi at the manger. Everyone knows the story. They had made a long journey from the East, following a star and stopping by the court of King Herod on their way to Bethlehem. Herod’s interest was piqued (and his jealousy inflamed) by their mention of an infant king, and he asked them to return to his court to report what they had found. Instead, having been warned in a dream that Herod’s interest in the Christ Child was not benign, the Wise Ones returned home by a different route. This year, just at the time of hearing this story in church, it happens that I am planning a journey I will soon take with two traveling companions—a friend and a dog. Our round trip will involve driving about 2500 miles. 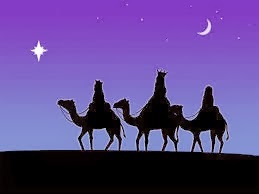 Unlike the Magi, we will not follow a star to some vaguely defined location; rather we expect to traverse a route laid out with help from various internet and automobile club sources to get us to a specific address by a particular date. 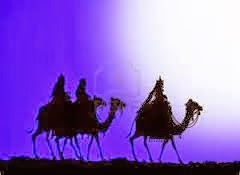 Like the Magi, however, we will return home by a different route (though in our case, the change will be governed by our having more time on the back end of our journey, and thus the chance to take a more leisurely route and one with—ahhh!—fewer interstate highways and less frenetic traffic). This juxtaposition of biblical story and real life planning has set me to thinking about what it means to take a journey. First, of course, we must decide where it is we hope to go. Then there is the matter of getting travel directions. How do we choose which signs to follow? Whom do we trust to tell us which roads to take? How do we discern when our course might be in need of adjustment? Though our answers will be decidedly different—at least on the surface—from those the Magi might have given, here in the first days of a New Year, these are not bad questions to ponder, whether we are making a road trip or simply going about our daily routine. Particularly if we want to live as fully as possible into the season of Epiphany, acknowledging the Light that has come into the world (and perhaps having our courses readjusted by that Light), they are worth spending some time on. And so, how about you? Where is that it you hope to go today, this week, this season? Who will you travel with? How will you get there? Whatever your destination, may your travel directions lead you in ways that are holy, flexible, and wise. For the most part I avoid New Year’s resolutions. 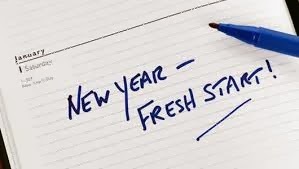 I’m all for change and self-improvement, but making a list in early January generally doesn’t get me there. Then yesterday I happened upon this Psalm written from Eugene Peterson’s The Message: “My choice is you, God, first and only.” ( Ps. 16:5). Since then I have been wondering what it would mean to try to live those words in 2014. When I am stuck at O’Hare, and can’t get home, I will choose God. I don’t know what it will mean to ‘choose God, first and only’ in the midst of these and other yet-to-come situations. Probably something a little different every time. But my resolution is to go to God in the midst of these life events, to trust that God can be found here and in all of life. Maybe to remember what I have discovered in the past: that in God there is wisdom, or courage or forgiveness. In her book Help. Thanks. Wow., Anne Lamott writes, “My belief is that when you’re telling the truth, you’re close to God.” So that is it—in 2014 I will choose to come to God with the truth of my life. And maybe go to Italy for pasta and ice cream.